Solar power is billed as the energy of the future. However, today, solar power constitutes less than 1% of the global energy market. Though some cynics point their finger at a “Big Oil” conspiracy, the actual explanation for why solar power has remained such a disappointment is much more mundane. The reasons boil down to basic physics, economics, and impracticality. A better fix would be to find a way to store solar energy in liquid form, commonly referred to as solar fuel. And a team of Harvard scientists have devised a clever way to do just that with a bioelectrochemical cell that utilizes genetically engineered bacteria. As shown on the left side of the figure above, the authors used a fairly straightforward electrochemical cell to split water into molecular oxygen and molecular hydrogen. (They used an external source of electricity to do this, but eventually, the goal is to use photovoltaic cells powered by sunlight.) Oxygen was created at the anode, while hydrogen was created at the cathode. Now, the clever part: The authors created a solution that was amenable to bacterial growth. They added some carbon dioxide (food source), along with the bacterium Ralstonia eutropha. 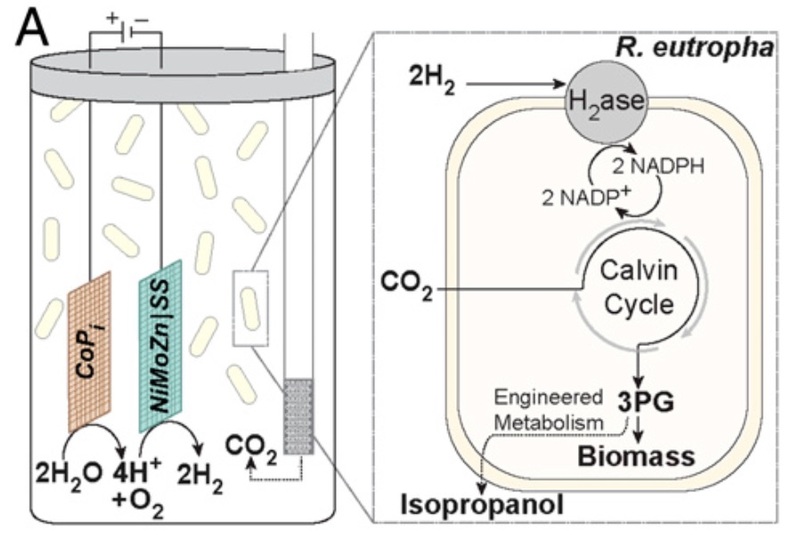 As shown on the right side of the figure, the bacterium gobbled up the hydrogen, which it used as a source of electrons to reduce the carbon dioxide into biomass, which, like wood, can be burned for fuel. Biomass is nice, but liquid biofuel is better. So, the authors genetically engineered R. eutropha to produce isopropanol (rubbing alcohol). 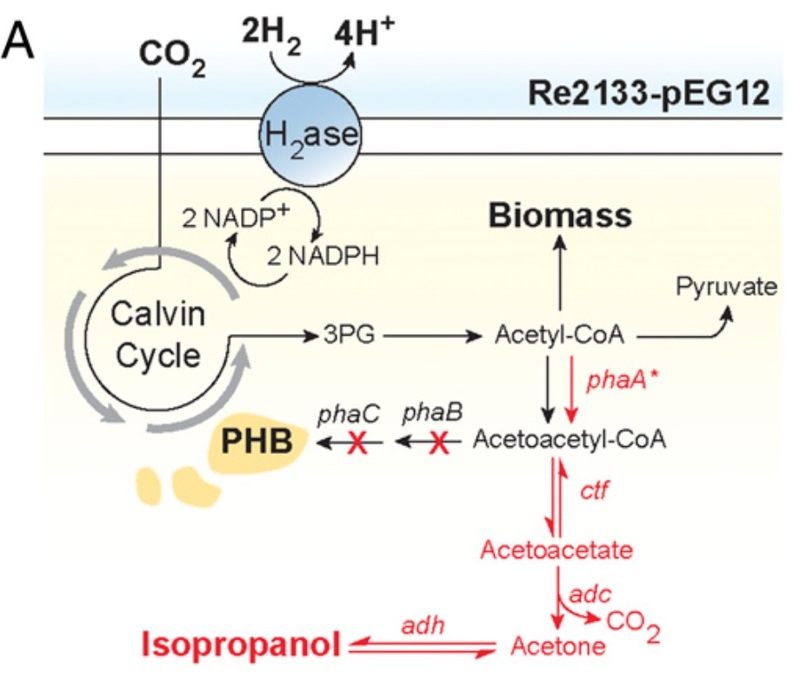 The addition of four genes (named phaA, ctf, adc, and adh) allowed the bacterium to convert acetyl-CoA, an important molecule in metabolism, to isopropanol, which can be used as fuel. As intriguing as this invention is, there are some serious obstacles that need to be addressed before it could ever be useful. First, the authors’ bioelectrochemical cell still does not solve the problem of poor solar cell efficiency. Their proof-of-principle device used an external source of electricity. If they were to use a solar cell, the efficiency of the entire system could be reduced by as much as 90%. Yet, even with that factored in, the authors claim that their solar-to-fuel efficiency is similar to that of crops used to produce biofuel (ethanol). Second, like ethanol produced from crops, isopropanol is soluble in water. (Both ethanol and isopropanol are alcohols.) Water mixed with alcohol creates something known as an azeotropic mixture, which requires a lot of energy to separate. It is possible, therefore, that without tight control over energy consumption, such a system could consume more energy than it creates. Obviously, that’s self-defeating. Perhaps burning the bacterial biomass may be more efficient. Alternatively, it may be better to produce a fuel that is not soluble in water, such as propane, which can effortlessly bubble to the surface. (We reported on a group pursuing that line of research last year.) That would require less energy to produce the final product. The bottom line is that while the bioelectrochemical cell is creative, it essentially takes an inefficient process (harvesting solar energy) and reduces its efficiency even further. Unfortunately, until all the kinks of solar and bioelectrochemical cells are worked out, we’ll have to continue burning dead dinosaurs.